Reliability and accuracy are paramount in personal defense situations. Federal® Personal Defense delivers both when you need them most. Federal Personal Defense, .45 ACP, JHP, 185 Grain, 20 Rounds is rated 5.0 out of 5 by 5. Rated 5 out of 5 by David from Super price for very good concealed carry ammo1 You can not beat the price,and with free shipping on orders of $75 or more you can't beat the deal. 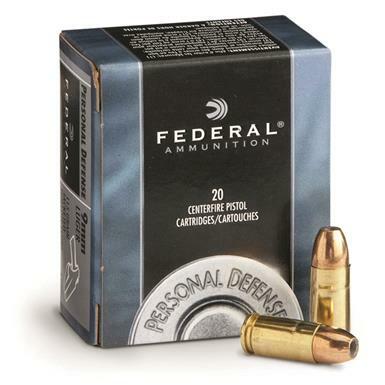 Great concealed carry ammo the reliability of Federal ammo is very good. Rated 5 out of 5 by Yardgnome from BEST DEFENSIVE AMMO FOR THE MONEY! Clean burning and positive feeding. Excellent knockdown power with great trajectory. But where this really stands out is in smaller guns. I have a Para Ordnance Warthog with 3 inch barrel. 10 round capability makes recoil great at first, but once down to 6 or less, it get's felt. Probably why so many of these guns are on the used market. Loaded with this 185 gr bullet the recoil is much more pleasant through the entire mag. And accuracy in a full size or compact is really very good! Thank you! Rated 5 out of 5 by BOB from Came as ordered. Haven't shot them yet. Rated 5 out of 5 by RONALD from Excellent Ammo for CCW! Big expansion to stop threats cold. Big expansion stop threats cold!